Last Battle, known as Hokuto no Ken: Shin Seikimatsu Kyuuseishu Densetsu (北斗の拳 新世紀末救世主伝説) in Japan, is an action game developed by Sega for the Sega Mega Drive. As the Japanese name suggests, it was originally intended to be paired with the Japanese manga series, Hokuto no Ken, but the graphics were altered for a western release. In fact, it is a sequel to Hokuto no Ken, which was given the same treatment and sold as Black Belt overseas. It was a launch title for the console in North America. The game was ported to the Amiga and Commodore 64 by Elite Systems in 1991. IBM PC and Atari ST versions were apparently due to be released, but never were. 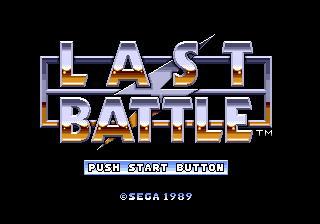 Last Battle is a very simple side-scrolling action game, where players control Aarzak (Kenshiro) across a set of levels punching and kicking enemies. On the Mega Drive, jumps, punches and kicks. Usually the objective is to walk to the right and hit enemies before they hit you, similarly to its predecessor Black Belt. Levels are presented in a non-linear order. The Japanese version of the game has since been re-released for the Japanese Wii Virtual Console service. Main article: Last Battle/Magazine articles.